There are few more unsettling things in a professional footballer's professional life than when your manager leaves the club. It starts a process of speculation and rumours, and ultimately the appointment of a new boss. In the main, most players are sorry to see their manager leave, especially if they have spent a number of years together at the club. For obvious reasons, not everyone will feel the same - a player who hasn't had a look in for a few months will not feel quite as disappointed as someone who has been playing every week. Then, the questions start - who will be the next manager? What style of football will he play? Will he want me? Everyone is on trial again. All managers have their own opinions on players, football is a career of opinions and opportunities. An incoming manager might already have formed his own view of you and you must be ready for your opportunity if a chance comes to either enhance that view or change that view for the better. Managers leave for a variety of reasons. Sometimes they do so because they have a chance to move up the football ladder, sometimes they are asked to leave because results haven't been good enough - it is inevitable that one day a manager will move on. We have just lost our manager, Gary Waddock. 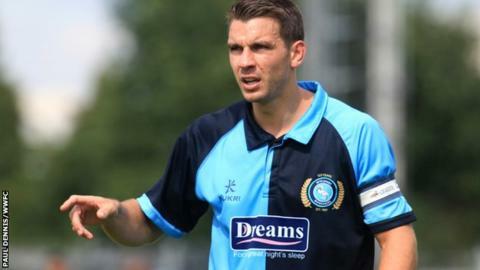 I am disappointed, as I have been with every manager that has left Wycombe. I have taken different things from each individual and tried to learn as much as I could. When I heard the news, the first thing I did was to text Gary to thank him for everything he had done for me and also to wish him all the best for the future. However, the most important thing now is the club and its supporters. Players and managers come and go but the fans will always be there to support whoever is representing their club. So we move on; we now have Gareth Ainsworth as caretaker manager and we will be doing everything we can to get a result for him and for the supporters who travel to watch us at Dagenham on Saturday. It is imperative that we start to improve results. The league has started as I thought it would, with mixed results for a lot of teams as there are so many that are evenly matched. Gillingham are leading the way and have a strong squad of players. They have an impressive strikeforce who are providing them with the ammunition to win games. It is a tough league though and anyone who finishes a point behind Gillingham won't be far off the top of the league.